1) being responsible for ourselves, picking up after ourselves. If you get something out, put it away. 3) chores – our chore system is a paid system. It is 3 tiered. If you are a little – you don’t do a chore. You also don’t get paid AND you miss out on some things we do for just bigs. They’ll get it someday – when they are old enough or responsible enough to do a chore. Even in the chore system, there are 2 more levels, entry and professional. Entry level gets paid, but doesn’t get benefits. (think hourly employee!) They make $5.00 every other week and they do a fairly small chore. Professional levels make perks! They make significantly more money. The people who help with dishes at my house make significanly more money than the person who empties the garbage. 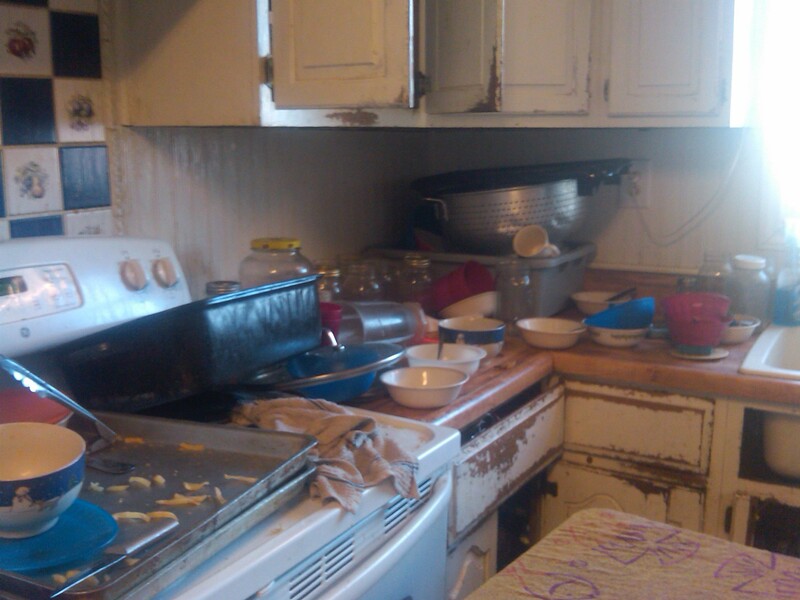 The person who is currently on dishes does all the dishes for a family of 16 every day with no dishwasher! He makes 25$ every other week. Other perks we have – late night snack :), movies, etc. Sometimes I am gone, sometimes I am busy or gone, sometimes I am tired. It isn’t an excuse. There are times where our house just doesn’t get clean. I try but recognize I am human, and that the bodies in my house will still be here tomorrow. I also try and recognize that disorder in the house makes others cranky (especially daddy who dislikes things under his feet!) Those are his feet in this picture and this is the only picture with him, his feet and floor). This entry was posted in Her Point Of View, Uncategorized and tagged All in A Day, family news by familyplushomestead. Bookmark the permalink. Question: What happens if chores aren’t done well? Does their pay get docked? I’d like to know more about how you implement this!